I am hosting a fundraiser to benefit the Hematology/Oncology family resource program at Boston Children’s Hospital because I want every kid to have the best care possible. The One Mission Resource Room is a center that helps provide services to over 45 families whose children are being treated at the Children’s Hospital Boston Oncology and Hematology Center by offering a space for patients and families to relax and connect with others going through a similar experience. Funded through donations from area businesses and families, The One Mission Resource Room is staffed by a patient and family educator who can help patients and families learn about their medical treatment. Whether the donated money be used for a morning coffee at the local Dunkin Donuts, or towards purchasing a generic American Express donation that can be used towards gas, or parking (daily routines that are often overlooked), each donation will help parents regain a sense of normalcy in their lives. I can’t emphasize how much The One Mission Resource Room helped my family and I when we were going through this difficult time. It’s because of their team and services that we were able to maintain a sense of normalcy and routine. This December I am asking you to join me in raising money for The Resource Room, and in doing so, helping to put the cheer back in the holidays for these families. As a thank you, I would like to invite each one of you in to one of my restaurants. Simply print out your donation confirmation and bring it into Cook Newton or Cook Needham so that we can give you a gift card (of up to $20 value) in return. 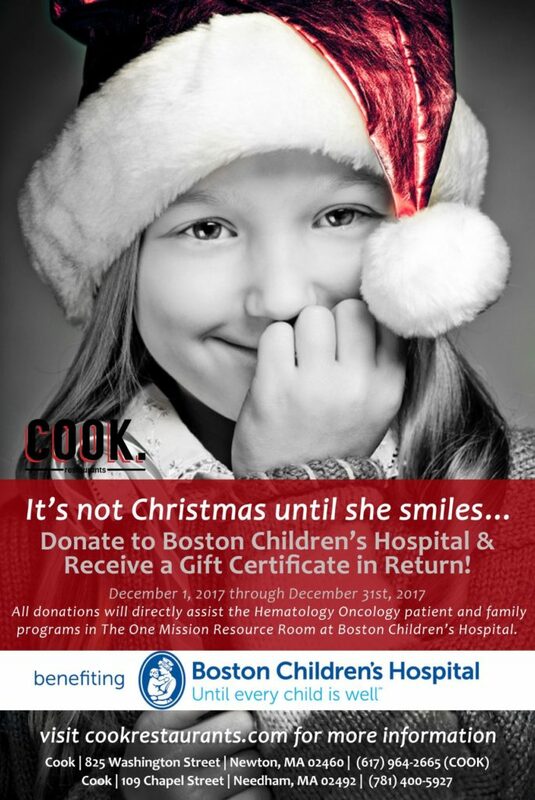 Additional Information: After donation, present your receipt at Cook Newton or Cook Needham to receive your gift certificate (of equal value, up to a $20 value). Limited to one gift certificate per person. Gift certificates cannot be combined with any other offer and can only be used at the respective restaurant. To receive gift certificate diners must visit Cook Newton or Cook Needham. Cannot be done online or via email. © 2019 Cook Restaurant Needham, MA. All Rights Reserved.